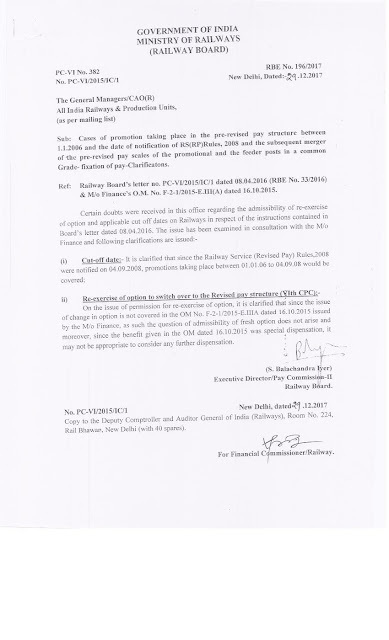 Sub: Cases of promotion taking place in the pre-revised pay structure between 1.1.2006 and the date of notification of RS(RP)Rules, 2008 and the subsequent merger of 'the pre-revised pay scales of the promotional and the feeder posts in a common Grade- fixation of pay-Clarificatons. 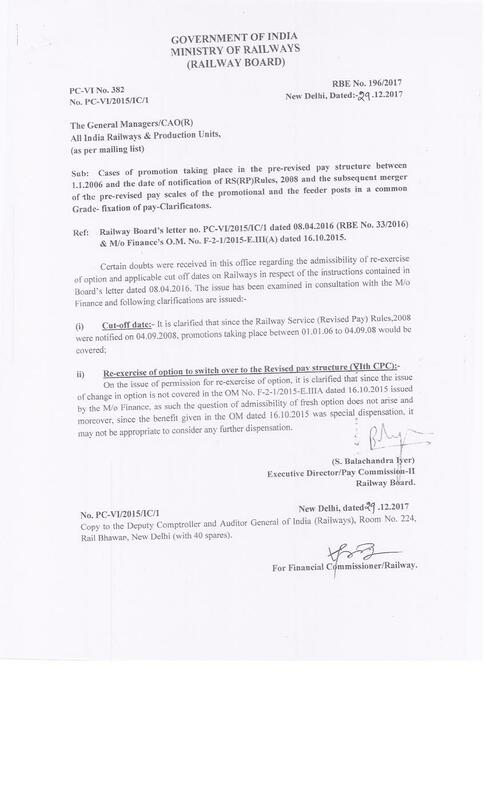 Ref: Railway Board's letter no. PC-V112015/1C/1 dated 08.04.2016 (REE No. 33/2016) & MTh Finance's O.M. No. F-2-112015-E.111(A) dated 16.10.2015. On the issue of permission for re-exercise of option, it is clarified that since the issue of change in option is not covered in the OM No. F-2-1/2015-E.IIIA dated 16.101015 issued by the M/o Finance, as such the question of admissibility of fresh option does not arise and moreover. : since the benefit given in the OIVI dated 16.10.2015 was special dispensation, it may not be appropriate to consider any further dispensation.